If yo are busy and want to access you recent apps and want to control you phone within a few touch clicks then floating touch app is for you. The application is available for iPhone and is now available to android users. Floating touch is simple and uniquely designed for android. The floating touch buttons moves around your android screen, over other installed apps and it can be moved to any part of the screen even over the widgets. This application contains the most commonly used switches of the android system such as Screen brightness control, screen lock, volume control, settings menu and the best of all everything in the app is user customizable. The size and transparency of the icon can be changed accordingly. 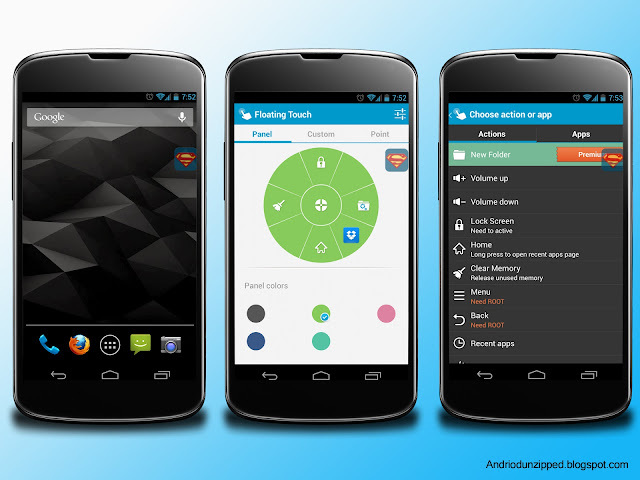 You can add any android setting switches or apps that you frequently use. The app is available in free and paid version, and the paid version has full features along with it.